28 gates offer guests not just luxury accommodation, but four private lakes, all yours to fish until your heart’s content! 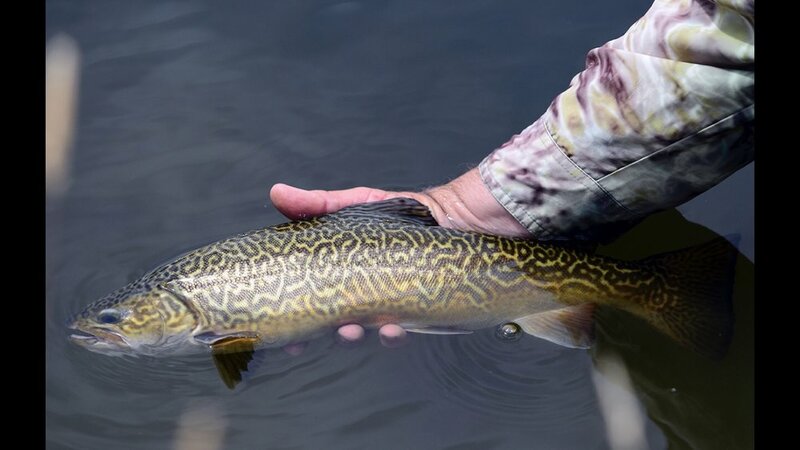 We are very excited to now have Tiger Trout in our Lakes which is a cross between Brown Trout and Brook Trout. We are one of the only fisheries where you can land one of these special beauties! The Lakes and Lagoons are a Fly Fishers paradise with Wild Brown, Rainbow Trout, Brook Trout and Tiger Trout in superb condition, feeding on a wide variety of insect life. Enjoy dry, nymph or wet fly fishing, dependant on the time of the year and who knows, you may catch a double figured fish!. 'Windsors Lake' is relatively new and covering new ground and is creating the Tasmanian phenomenon of 'tailing trout', through shallows for exciting Spring fishing. Don’t be surprised to be broken off or find yourself well into the backing, so come down and accept the challenge of 28 gates. If you don’t fly fish , we are only too happy to teach you, no fishing licence is required as we are a private fishery and you can fish all year round. If would like to fish further afield, make 28 gates farm stay accommodation your base and explore Tasmania's famous Highland Lakes, which are just a short drive away or local rivers and waterways. If you need instruction or a few extra tips, private and professional fly-fishing guides and instructors including Ken Orr's Tasmanian Fly Fishing Lodge can be arranged on request.....highly recommended! Pay only $1850 for 2 nights and 2 days Guided Fly Fishing Tuition with breakfast and other special treats included. No fishing licence, so you can fish all year round to your hearts content. To book this package, contact us to secure your booking. Taste your way through the history of Meadowbank and Tasmania with your own private Meadowbank Farm + Vineyard Experience. Meadowbank is the second-oldest, continuously- owned run family vineyard in Tasmania, producing premium fruit for award winning winemakers across the country.Your experience starts in the vineyard, learning about what makes Tasmanian fruit, and Meadowbank fruit in particular so highly sought after, before wandering down to the wine library for what we jokingly call our "How to be a wine snob in 45 minutes" class. Carrying your own favourite wines, return to the vineyard for lunch with your hosts. The surrounding 6000 acres are rich with soils for growing perfectly imperfect fruits and vegetables, lush with pasture for grazing sheep, and flowing with pristine waters for growing Atlantic Salmon - all of which means, lunch is generally sourced from within a short stroll away. Arrive as guests, leave as friends. Cost: $300 per person (up to 6 guests) from 10:15 - 4:30 plus $100 transfer fee per group if needed. There are five well marked walking tracks on the property for anyone seeking activity. These include A Rams Trail, ‘Bloomfield’ Panoramic, Valley Run, Kelly’s Hill and Lakes Walk. Go for an easy stroll or take a day hike through pastural, rolling hills and discover the muted beauty of the Australian bush. You could even take a picnic to indulge in. See how many of our 60 species of birds you can spot, particularly 7 of the 12 endemic birds of Tasmania. Walk on dusk with native animals in their natural habitat, including wallabies, kangaroos, possums, quoll, wombats, echidna and Tasmanian Devils. If you are lucky enough to be in the right place at the right time, you may spot one of the Wedge Tailed Eagles...a sight to be seen!. If you are interested in landscape photography or inspired by the unique surroundings at 28 gates, why not engage local photographer Alan Leisheim, for some one-on-one photography tuition. Please enquire to make a booking. "Bloomfield" is not only historic land, but a working sheep property with annual shearing in June. If you are a guest at this time, you’re welcome to watch for a taste of busy farm life in Tasmania. Farming is relentless, there is something to be seen all year round! Experience a farm stay tour with the owners and you can expect an interactive history of the property, an overview of the workings of 'Bloomfield', inspection of the shearing shed and learning all about the wool and general friendly, farming banter. Every day is different on the farm so we can’t predict what you may experience, in September, we have an influx of 5000 lambs which are always beautiful to see. If interested, you will have the opportunity to feed our beautiful farm animals including our horse (Poppy), sheep (Tilly, Nibbles, Betty and Alfie), rabbit (Bonnie) chooks and of course our wonderful dogs, Barney, Blacky and Peggy. This is popular with all ages and and all part of the 28 gates experience. Interested in feeding animals? We have many pets including horse, sheep, rabbit, chooks and of course our beautiful dogs...Barney, Blacky. and Peggy. All ages are welcome in feeding and interacting with these animals. If interested, we can take you out on a 'wild life night tour'....you may see wallabies, kangaroos, potoroos, quolls, possums, wombats or even a Tasmanian devil. This experience is special as you see them in their own habitat. Experience our 'wildlife night tour!” We will take you out and see the animals in their own natural habitat, you may even see wallabies, kangaroos, potoroos, possums, quolls, wombats and maybe even a Tasmanian devil. There is no extra charge for this tour. Experience a special, private and scenic picnic on the property on sunset. Take in the views and quietness, whilst having a Tasmanian sparkling or still wine with local cheeses and biscuits.....bliss! Par Avion in Hobart will take you either on a scenic flight via Hobart or direct to 28 gates and you will land on our property in one of our paddocks and we will come and greet you. Experience the natural beauty of the landscape from the sky and arrive in style! Enquire for availablilty and prices. A short clip from IFISH Tasmania featuring 28 gates near Gretna, Tasmania and the private fishery on the 5000 acre property. In this episode of IFISH, Paul seems to be seeing rainbows!